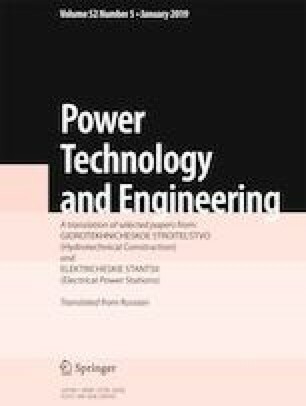 The great practical significance of a computational determination of the frequency characteristics of the front parts of turbogenerator stators for assuring reliable and safe operation is noted. Critical questions related to computational determination of the eigenfrequencies are considered as are different computational techniques. A combined computational and experimental method of determining the frequency characteristics based on the method of finite elements in a three-dimensional formulation is proposed. The basic steps of the method are considered and special attention is devoted to the stage of developing boundary conditions in light of the data of experimental investigations. Results of a comparison of the computational and experimental spectrum of the eigenfrequencies of the output buses are presented. Translated from Élektricheskie Stantsii, No. 9, September 2018, pp. 23 – 28.